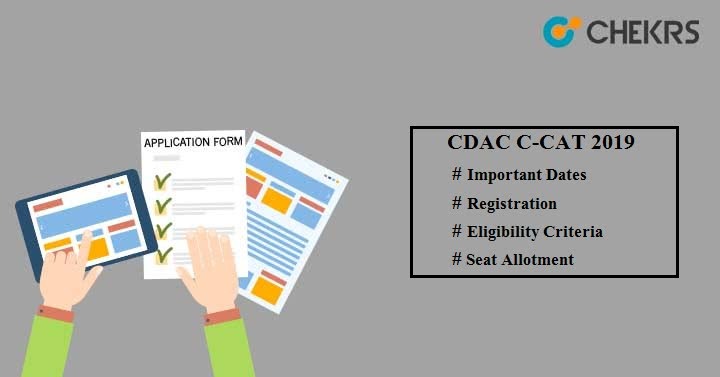 CDAC C-CAT 2019: Are you interested to take admission in various PG Diploma courses of C-DAC for February session 2019. Apply here!! Latest Update: The result for CDAC C-CAT 2019 has been announced. Check the direct link below to Get your result. Online Registration for C-CAT has been started from 23rd October. C-DAC’s Computerized Common Admission Test (C-CAT) is organized twice in a year in June & February month via Online mode. The Test will be held at various centers in 29 cities. Candidates can check the official C-CAT Exam Date in the table given below. Candidates must ensure that they satisfying the Eligibility Criteria of those courses for which they are applying. If you fail to do so, your candidature will be canceled. Candidates must have completed the graduation in engineering or equivalent programme (e.g. BE / BTech / 4-year BSc Engg / AMIE / DoEACC B Level) in IT / Computer Science / Electronics / Telecommunications / Electrical / Instrumentation). Must have Post Graduate Degree in Engineering Sciences with a corresponding basic degree (e.g. MSc in Computer Science, IT, Electronics). Students should have qualified past degree with minimum of 50%. There will be no age restriction to take admission in any course. Registration will be done with online mode. C-CAT Application form will be available on the official site only. Visit the CDAC official website. Go to the Candidate New Registration link. Enter your Personal details and submit it. After registration, login to your account and fill the application form. Pay the Application Fees as per your opted category. No exam pattern is described by official authority at the website of CDAC. It will help you to understand the pattern of paper, total time, marking scheme, no of total questions etc. C-CAT Syllabus is available by CDAC on its official website. Go through the complete syllabus, prepare accordingly and score good marks in the exam. The syllabus is comprised of 3 sections. It includes important topics such as English, Quantitative Aptitude, Reasoning, Computer Fundamentals, C Programming, Data Structures, Data Communication &amp; Networking, Object Oriented Programming Concepts, Operating Systems, Computer Architecture, Digital Electronics and Microprocessors. After applying successfully for CDAC, students will be able to download their admit card from website. The official authority will provide the CCAT Admit Card via Online at CDAC website. Login to your account with login credentials and download your admit card. It is mandatory document to be taken to the examination center as it contain candidate’s detail, examination center, timing, date & day and other important examination instructions. Result for both C-CAT I & C-CAT II will be made available from 27th December. You will have to visit the official website in order to download your C-CAT 2019 Result online. Search for the result download link and click on it. Enter the required details and submit it. You will see your C-CAT Rank Card on your computer screen. After result declaration, admission will be done be on the basis of counselling & seat allotment procedure. CCAT Counselling will be held in 2 rounds online only. Register at the official website to participate in the counselling rounds. Fill the choice form to select courses & training centers of your choices. Later based on candidate’s merit rank, seat availability & choice preferences, seat will be allotted. Submit the fees in installment to confirm the allotted seat before the due date.